Slight change of plan today. The distances over the last few days have been a bit too much, so we have rescheduled a bit. Today, we cut it down to 13.5 miles, which, to be honest was plenty. My feet are very achey and Rachel’s knee is twinging. 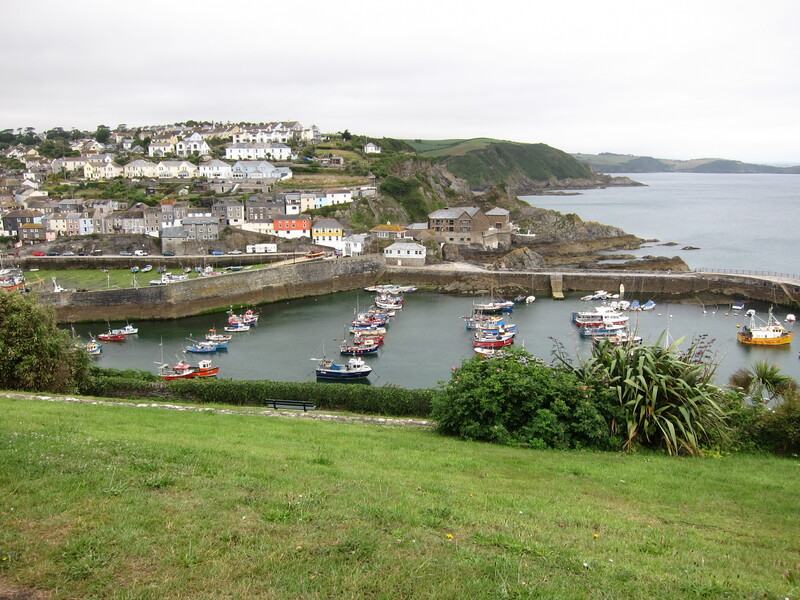 When we left Mevagissey this morning, at about 10am, the weather was overcast and a bit soft, but nothing too serious. Climbing out of the town, we could see the lighthouse we missed yesterday coming out of Fowey. The first headland had a very interesting looking house. Part of it certainly looked mediaeval. It was at Bodrugan’s leap. I shall look into that as the Bodrugans of Cornwall are in my family tree – maybe one of my ancestors leapt off the headland rather than be caught by the revenue man…It looked ideal for running a cargo of brandy! The ups and downs weren’t quite so extreme today, but there were plenty of them. Thankfully, there were no route confusions. The first stop was Gorran Haven, a very typical little town, not quite so dolled up as some of them. 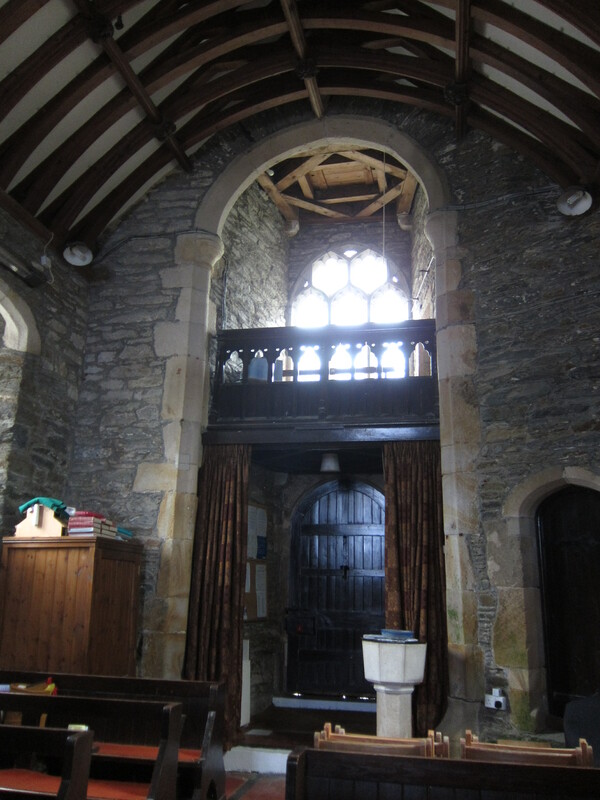 There was a tiny Chapel of Ease, dedicated to St Just. Apparently it has been there for 1400 years (although it spent some time as a fishmarket in the nineteenth century). Quite amazing to think of some ancient Celtic saint living there with the sound of the sea. We contemplated that as we ate cake and coffee. The other big excitement of the day was the pod of what we took to be porpoises but were late informed were bottle-nosed dolphins. We spotted them around 300 yards out from the shore. We were high up on the cliff and could see them playing in the waves. They moved quite fast – definitely faster than us! Apparently there are about ten resident pods of some 50-100 individuals who live in Cornish waters. They are around 8 – 12ft long. We passed Caerhayes castle – then had what the sign claimed was only another 2.25 miles to do but it seemed much more. Each time we rounded a headland thinking ‘this must be it’, there was another headland behind with no sign of the town. 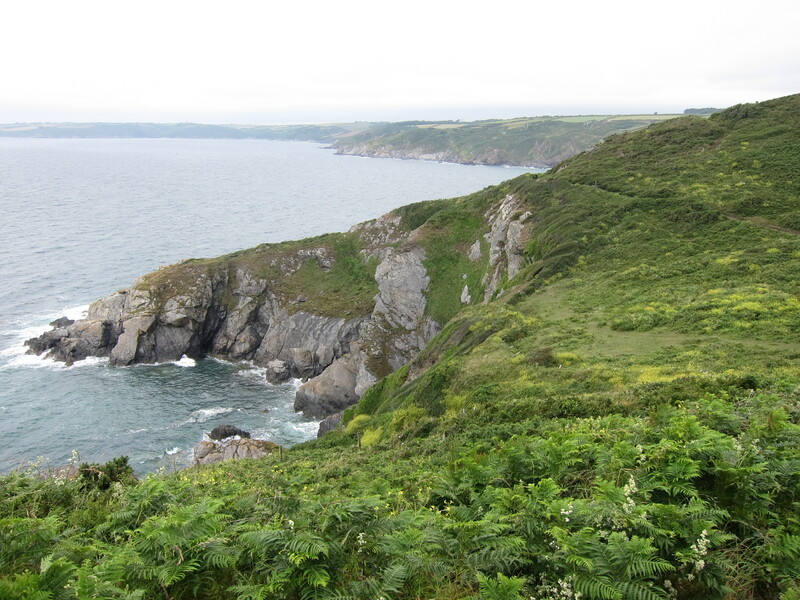 Experienced hill walkers will have come across the false summit – in Cornwall, there are false headlands. A mere deviation from the horizontal on the map turns out to be a huge headland on the ground. Finally, we arrived at Portloe. The first place we saw was a restaurant named the Lugger. The receptionist informed us that they were not serving dinner. The unspoken words ‘to ragamuffins like you’ hovered on the air. She thought the pub might be able to accommodate us, and indeed it did. A very nice meal indeed. Then, because the last bus had sailed past as we walked into the town, a short taxi ride to our very nice B & B. Another good Cornish name – Trewithian. 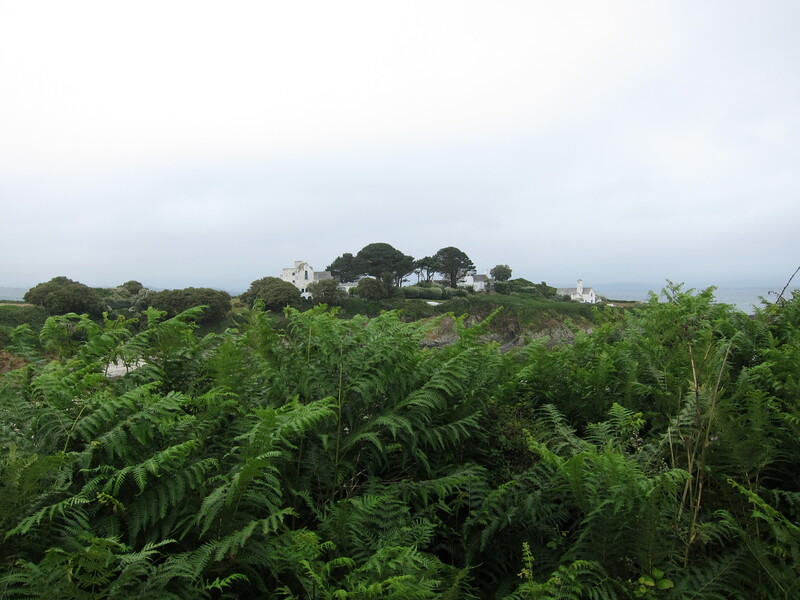 I am thrilled to see so many Cornish house names – many of them identical or very close to Welsh – Pencarreg, Gwel-mor, Mordros, Chy-an-haf (assuming the meanings are the same as Welsh, they are Summit-stone, Sea-view, Over-the-sea and Summer House). 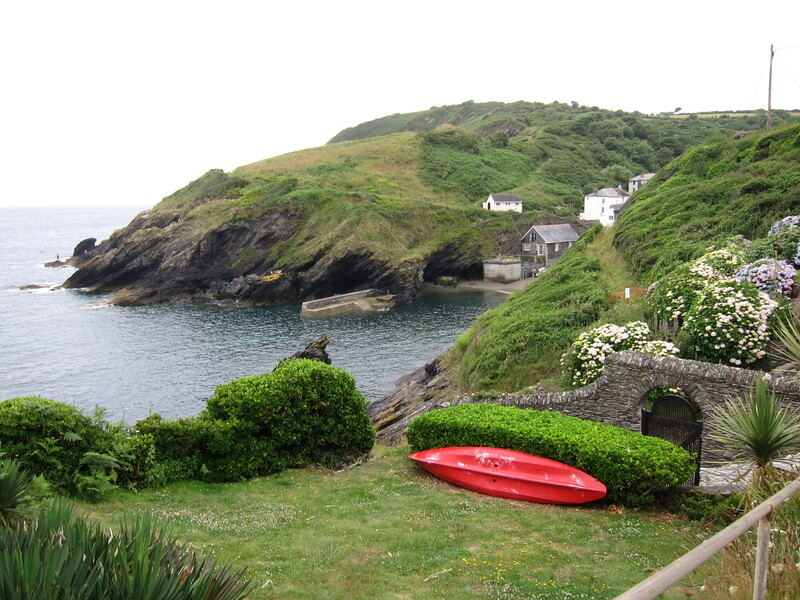 Tomorrow, I will go back to Portloe and Rachel will go on to catch her train from Falmouth. If you’re a Bodrugan you might enjoy reading The House on the Strand by Daphne DuMaurier.